I recently had the pleasure of trying MozzaPi in Louisville Ky (a fantastic wood fired pizza restaurant). We tried a small sampling from the menu and everything we ordered was delicious. 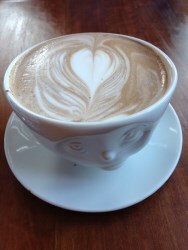 The hot chocolate was served in an adorable face cup with heart foam design. We tried a salad which had some wonderful parmesan on top. We also ordered two pizzas (our standard pepperoni & spinach & ricotta). Both pizzas were perfectly cooked and we had leftovers for lunch the following day. We also purchased a loaf of Rosemary Focaccia and a muffin to take home and thoroughly enjoyed both. The staff at MozzaPi were prompt & friendly. We love supporting local businesses and were happy to hear about all of the other community involvement from the owners. Along with serving at the restaurant, the company also caters, teaches classes in how to make your own artisan bread, & mills their own grain at Louismille. MozzaPi is open from 7am-2pm Tuesday-Friday with breakfast (baked goods & coffee) from 7-11 and lunch from 11-2. On Saturdays & Sundays the restaurant is also open from 7am-2pm but brunch is offered along with baked goods and coffee in the morning hours. If you haven't tried MozzaPi yet, I highly recommend it. You will not be disappointed. MozzaPi is located at 12102 La Grange Rd, Louisville KY 40223. To learn more about other places to eat in Louisville or to learn about Louisville Real Estate, we welcome you to continue to read our blog or call us at 502-371-1173. Last night, we had a great team outing to the River House restaurant. River House is a fairly new seafood restaurant and raw bar that is owned and operated by an award-winning chef. It is located along the riverfront on River Road next to the Water Tower. The restaurant has a unique design and is in a building that was previously a marina. We really enjoyed the restaurant and loved the mussels, brie, crab tower, and the peel and eat shrimp. River House is open seven days a week and they have lunch, dinner, and Sunday brunch menus. Reservations are recommended, and the hours are 11am-11pm Sunday through Thursday and 11am-12am Friday and Saturday. To view menus, make reservations, or for more information on River House, visit the River House web page. For any questions about Louisville Real Estate, call the At Home In Louisville Group at 502-371-1173. 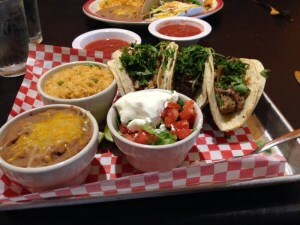 Louisville has plenty of Mexican restaurants to choose from, and Ramiro's Cantina is one that is worth a visit! 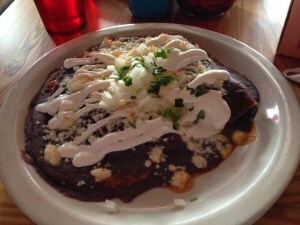 Located on Frankfort Avenue, Ramiro's is a great place to visit with good food, drinks, and atmosphere. The restaurant has received generally positive reviews and has a 3 out of 5 star rating on Yelp. There is a large selection of food to choose from and they offer lunch, dinner, and Sunday brunch menus. 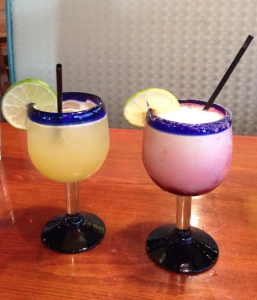 They also have a great selection of margaritas with flavors including lime, banana, raspberry, strawberry, peach, and mango! 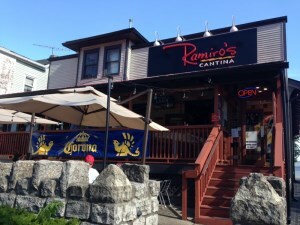 The location of Ramiro's Cantina is great and the restaurant includes a patio and deck that are perfect to enjoy the weather while dining. The restaurant is open seven days a week and the hours are 11am-10pm Sunday through Thursday and 11am-11pm Friday and Saturday. To browse the menu and for all other information about Ramiro's visit their website. For more information about the Louisville area or to discuss homes in Louisville, call 502-371-1173. 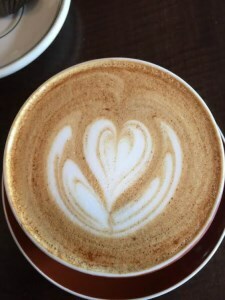 When it comes to coffee everyone knows about Starbucks, but have you ever tried Quills Coffee? Quills is a local coffee shop with three Kentuckiana locations (two in Louisville and one in New Albany). Visitors praise the coffee shop for their drinks, service, and atmosphere, and they have given an average rating of 4.5 out of 5 stars on Yelp. They offer a variety of great coffees, teas, non-coffee drinks, and baked goods, and they even add latte art to your drink! Quills Coffee was opened in 2007, and their selection of coffee comes from countries all around the world. Last year, they won the title for the America's Best Coffeehouse competition at CoffeeFest Chicago! Quills is open seven days a week and the hours vary by location. Call 502-371-1173 for more information about things to do in the area or Louisville Real Estate. My husband and I recently tried Zeggs Amazing Eggs for the first time. Zeggs has three locations in Louisville (On Chamberlain Ln, Shelbyville Rd in Middletown, and on Lime Kiln). The Middletown location opened recently and is close to our home. I would describe the atmosphere in Zeggs as a mixture of Panera & Wild Eggs. While the food offered is similar to a Wild Eggs menu, the service is reminiscent of Panera in that orders are placed at the counter and delivered to the table. 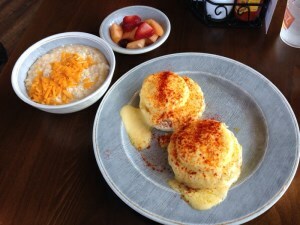 I ordered the Eggs Benedict (a personal breakfast favorite) & the cheesy grits. My husband ordered the Picosa (an omelette with spices & avocado) along with a side of breakfast potatoes. We both enjoyed our food. We always enjoy trying new local businesses. The restaurant also serves several other versions of eggs benedict & omelette varieties as well as sandwiches, french toast, pancakes, waffles and other breakfast staples. The restaurant offers a bar with bloody marys and mimosas. 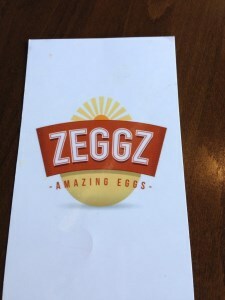 Zeggs Amazing Eggs is open from 7am-2pm Monday-Friday and from 7am-3pm on weekends. For more information about things to do in Louisville, places to dine, or the current Louisville Real Estate market call 502-371-1174. 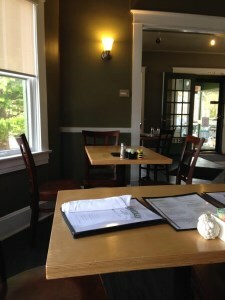 My husband and I recently made our first trip to Coals Artisan Pizza in Middletown. Coals Pizza first opened in Louisville in 2011. The Middletown location opened in 2016 and has been packed ever since. 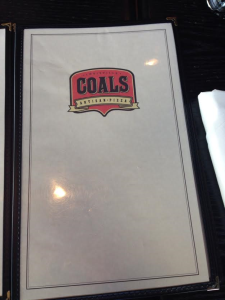 Coals has won a few magazine awards for best pizza and advertises itself as "the first coal fired pizza in the state of Kentucky" according to the Coals website. The interior of the establishment has a pleasant atmosphere with an industrial design. 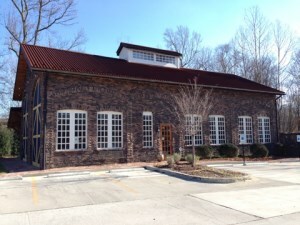 The Middletown branch features a large bar, table seating, and a party room. The menu offers a wide selection of wines as well as a variety of Italian appetizers, salads, traditional Italian desserts (including Cannoli & Tiramisu), and of course an expansive selection of pizzas (with a make your own option available). We tried the Meatball Parmesan & shared the "Waverly" pizza. The meatball appetizer was good. We thought the pizza named after the various areas around Louisville was a unique touch. 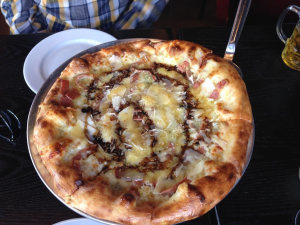 The Waverly pizza included gorgonzola, fig jam, & balsamic (to name a few ingredients). The pizza was quite good and we had some leftover to take the next day for lunch. Coals Artisan Pizza proved to be a nice evening out and was delightfully close to our home in Middletown. 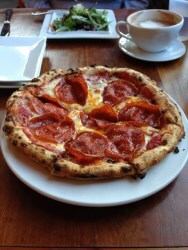 What is your favorite location for pizza in Louisville? Call 502-371-1173 for more local info or to discuss homes in Louisville, KY. 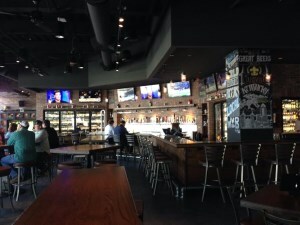 I recently made my first visit to World of Beer, located off of Brownsboro Rd (near Norton Brownsboro Hospital) in Louisville, KY. World of Beer is a chain restaurant with numerous branches located primarily across the eastern US. 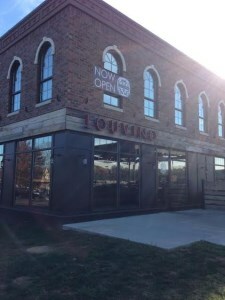 The Louisville World of Beer tavern opened in late 2015. The restaurant received a lot of buzz and I've been curious to see what it was all about. Not surprisingly, this restaurant exists for the beer lover. 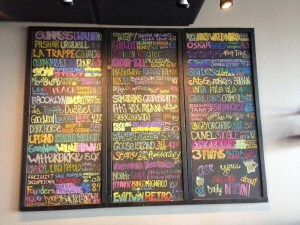 The chain offers over 500 beer selections! You can find beers from around the world as well as numerous local selections. You'll notice in the photos how many beers are on tap! If you love beer, you'll have a good time checking this place out. The World of Beer also offers a full menu. I would describe the food as fairly typical pub style food. There are a selection of appetizers, flatbreads, sandwiches, & burgers. The food was fine, but the draw here is definitely the beer. The selection of drinks is almost overwhelming and my husband spent forever choosing what to sample that day. This is a fun place to try. Call 502-371-1173 for Louisville area info or to discuss Louisville Real Estate. My husband and I celebrated our wedding anniversary last week and had a wonderful night out at Volare. Volare is a fine dining establishment that opened in Louisville in 2004 and has a great reputation with Louisville locals. Many refer to it as favorite for anniversaries, birthdays, and other special occasions. It was our first visit and we had a lovely time. The atmosphere inside Volare was quiet and intimate with dim lighting, soft live jazz style music, simple yet elegant decor, and a large eye catching wine rack. We tried several menu items beginning with a couple of drinks. My husband ordered a beer and I had the Volare Manhattan (which was great with our appetizer). 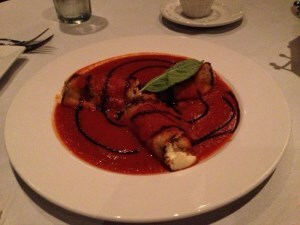 We tried the Rotollini Di Melanzane (eggplant rolls) which were superb. I love eggplant and this was a great start to the meal. 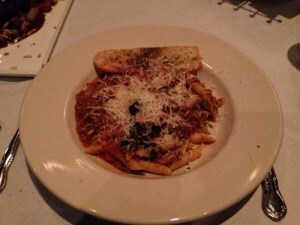 For entrees we enjoyed the Roasted Duck & the Penne Bolognese. The Penne pasta dish was very good, but the Roasted Duck was fantastic. I'm not sure if I've ever tried duck before but it was mouth watering delicious. The sauce on the duck was perfect accompanied by golden raisens. Both dishes were large enough to provide us with lunch the following day. For dessert we ordered both the cannoli & the tiramisu. Both desserts were a nice finish to the meal, and I think we both preferred the tiramisu. Overall my favorites were the eggplant appetizer & the duck. 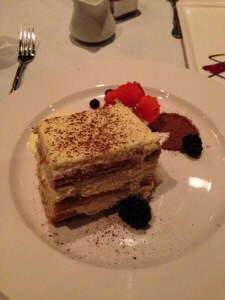 If you're looking for an indulgent date night or celebratory meal, Volare is definitely a solid choice in Louisville. The wait staff was all incredibly polite and made our evening memorable. Call 502-371-1173 today for more information about the Louisville area or to learn more about the Louisville Real Estate market. 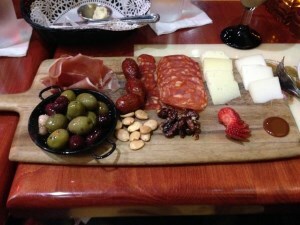 Last weekend my husband and I had the pleasure of dining for the first time at Mojito Tapas. Mojito Tapas and Havana Rumba are owned by the same individuals and both establishments provide similar embiance & service. 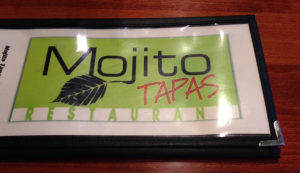 Mojito Tapas is located in Holiday Manor just off of Brownsboro Rd near Herr Ln. We had a great time & thoroughly enjoyed each item we tried. We ordered a traditional margarita on the rocks as well as a frozen margarita mixed with sangria. Both drinks were good and the sangria margarita was an interesting try. For dinner we ordered the Solomillo al Cabrales, Empanadas, and Datiles Rellenos. The Sollomilla al Cabrales was a beef tenderloin on a bed of mashed potatoes. It was cooked perfectly and had wonderful flavor. The Empanadas were delicious. The Datiles Rellenos were dates stuffed with cheese & wrapped in bacon- yum! The dates were a favorite for both of us but everything was worth repeating on a return visit. For dessert, we shared the churros which were to die for & accompanied by chocolate sauce. If you enjoy Havana Rumba, I believe you will find Mojito Tapas an equal partner & a fun date night in Louisville. For more information about things to do in the Louisville area or for help purchasing or selling your home in Louisville, call 502-371-1173 today! 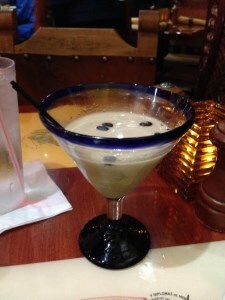 My husband and I enjoyed a night out at Havana Rumba recently. 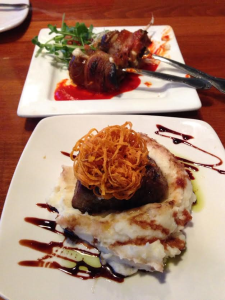 This is a favorite for us when searching for a quality meal with a little variety. Havana Rumba opened in 2004 in the St Matthews area and has been extremely successful. The second location opened in Middletown in 2010. We generally frequent the Middletown location, but have visited both more than once. 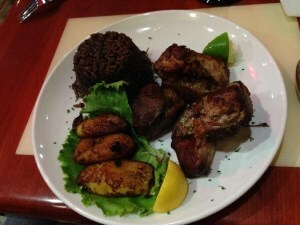 Since we started going to Havana Rumba I have found the meals to be consistently good. We have tried a wide variety of menu items from appetizers, to entrees, to drinks, to desserts. I have never ordered anything bad at this restaurant. Where appetizers are concerned, you really can't go wrong with the empanadas. The Cuban Sampler is a fun way to test out the appetizers. My personal favorite meal is the Fricase de Pollo, which I would describe as a variety of stew with chicken as the protein, potatoes, & a creole style broth. It is truly delicious & comes with rice & plantains (a must at this place). 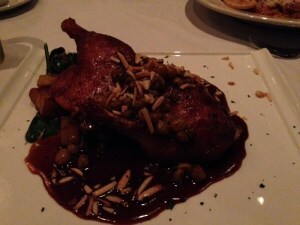 Over the weekend, my husband and I stopped in for dinner at Caffe Classico. The restaurant is located inside of a putty gray brick building on the corner of Frankfort Ave & Clifton Ave (just next to The Clifton Center). Whether you're looking for a quick cup of coffee & a pastry, lunch, or a candlelit dinner, Caffe Classico offers a quiet dining experience. The restaurant is open all weekdays (except Tuesdays) and over the weekend. Visit the website linked above for detailed hours and a contact number. On one side of the venue you'll find a coffee bar setting with pastries which is open during breakfast hours. The other side of the building is a traditional restaurant setting with a small stage in the corner that often features local musicians. On the night of our visit we enjoyed listing to Gareth Jones play Flemenco Guitar. The staff at Caffe Classico was very friendly & the environment was nice. 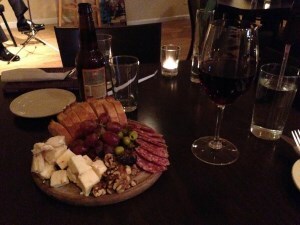 We enjoyed sharing a couple of drinks, the Tapita Rustica appetizer (cheese & olive plate), and the Turkey Club. I would recommend the cheese plate & wine. 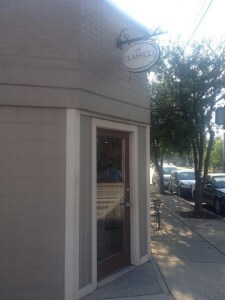 Try out Caffe Classico if you're in the Frankfort Ave area and looking for a quick bite. 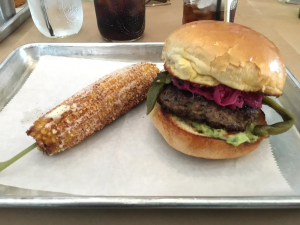 The food at Mussel & Burger Bar is already well known to most Louisville residents. The restaurant typically gets rave reviews from locals & it is no suprise that this restaurant has 4 1/2 stars on trip advisor. If you are visiting Louisville, this is a great spot to dine. If you're a local and have not yet stopped by, you are missing out! The owners of Mussels & Burger Bar formerly owned Havana Rumba. Now, the owner has teamed with a couple of friends to form OLE Restaurant Group which owns several restaurants in the Louisville area including Guaca Mole, El Taco Luchador, and Mussels & Burger bar to name a few. The group opened a 2nd Mussels & Burger Bar location in downtown Louisville in October of 2015. 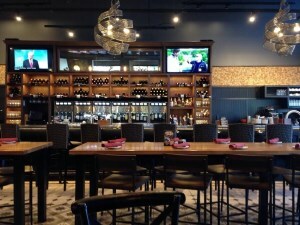 Artesano Vino Tapas opened in Westport Village this year also. They even have plans to open additional dining locations including reopening and revitalizing/rebranding Joe's Older than Dirt. 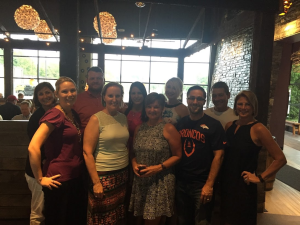 Our team recently had the pleasure of dining as a group at the Taylorsville Rd location of Mussels & Burger Bar. The atmosphere was great & the food was also. Our group ordered a variety of menu items. We tried the Short Rib Nachos & the Calamari (both very good). Members of our group also tried a variety of burgers & chicken sandwiches. Everyone had a nice time & will definitely be returning. We can't wait to see what else is in store for this group of entrepreneurs! For more information about Louisville, KY continue to follow our blog or give our team of Realtors in Louisville KY a call today! 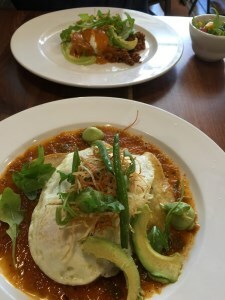 Con Huevos fills a unique niche as a Mexican brunch specialty restaurant in Louisville. The restaurant is located at 2339 Frankfort Ave, Louisville, KY 40206 and is open 7:30am-2:00pm Monday-Friday and 8:00am-2:30pm on Saturdays & Sundays. 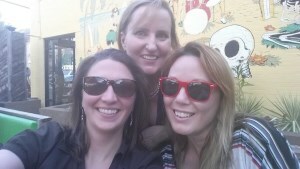 One of our agents, Melanie Jones, recently visited and had a great time. "The food was wonderful! Highly recommend!". 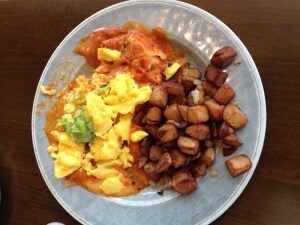 Menu options feature a variety of breakfast items with eggs, refried beans, queso, avocado, salsas, and veggies. You'll also find a lunch assortment of tacos, tortas, and salad. For dessert, tres leches pancakes & flan look particularly yummy. 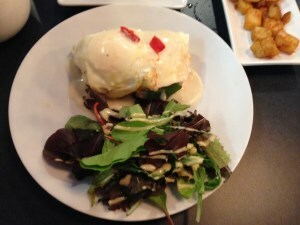 Give Con Huevos a try the next time you're looking for brunch in the Frankfort Ave area! Call 502-371-1173 for more information about the Louisville area or homes for sale in Louisville, KY! 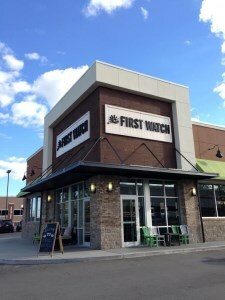 First Watch is a Breakfast & Brunch restaurant & franchise that opened its first location in Louisville in February of 2015. The franchise has over 90 locations across the country, and since its grand opening in Louisville, has gained primarily positive reviews. The building is located in a highly visible spot at 201 S Hurstbourne Parkway, Louisville, KY 40222 and generally stays pretty busy. I recently visited First Watch for the first time after several friends & team members recommended it. The experience did not disappoint me, and I am sure we will be going back. I ordered the Eggs Benedict Florentine & the seasonal Butternut Squash Bisque. The Eggs Benedict was great and the Butternut Squash soup rivaled Panera's recipe (which I love). My husband ordered the Cherry Chicken Quinoa Bowl which was delicious. 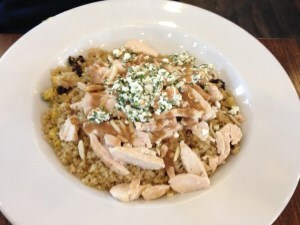 The quinoa was topped with chicken, goat cheese, almonds, dried cherries, & balsamic dressing. I actually will likely order the quinoa next time myself- it was that good! The building was clean, the staff was friendly, and service was prompt. We will be back to First Watch. If you're looking for another breakfast/lunch option along Hurstbourne, this is definitely a nice place to try. Contact us to learn more about Louisville, KY or to discuss Louisville Real Estate. Last Sunday , my husband and I decided to try a new breakfast spot after church. 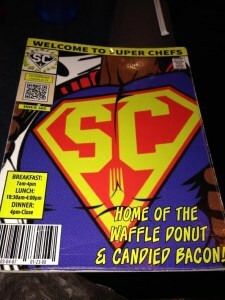 We decided to visit SuperChefs Louisville KY which features super hero décor & themed menu. The breakfast menu offers a variety of omelets, waffles, pancakes, French toast, and sandwiches. There were tons of appealing choices and we both had a hard time deciding what to try. I ordered the SuperChef’s Eggs Benedict, an interesting spin on the traditional dish that substituted a bed of red pepper grits instead of an English muffin. My husband ordered “The Hulk”. 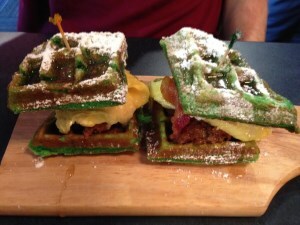 “The Hulk” was a waffle dyed green and turned into a sandwich with sausage, egg, cheese, bacon, and syrup- YUM! Both dishes were delicious! SuperChefs is located at 106 Fairfax Ave, Louisville, KY 40207, just off of Shelbyville Rd (between Meridian & Sherrin Ave). The restaurant is open from 9am-9pm and serves breakfast, lunch, & dinner. I would be interested to try out the lunch & dinner options and will definitely be returning for a repeat on breakfast! Call 502-371-1174 for additional information about the Louisville area or to discuss homes in Louisville. L ast Friday night our team enjoyed a get together at El Camino on Bardstown Rd with one of our preferred Lenders (Jason Justice, First Commonwealth Mortgage). A few of the group had been to the spot previously but for many of us it was a first. The outdoor patio seating provided great atmosphere. We sat in one of the larger booths complete with firepit in the center. The drinks menu seemed fairly extensive and our group enjoyed wine, beer, and cocktails. We ordered a couple of appetizers including the Chips & Mucho Guac as well as the Queso Fundido. The chips & guacamole appetizer was a fun way to try an assortment of salsas & guacamole. The Queso Fundido was delicious with a layer of melted cheese & a mushroom & meat mixture below. It also came with mini corn tortillas to use with the Queso Fundido as filling. We tried the Kitchen Sink Burrito- a creative though somewhat spicy dish with filling including rice, beans, queso, kale, and more. The best part of the experience was undoubtedly the company & energetic environment. The staff at El Camino was very friendly & prompt. Our group had a wonderful time. The restaurant is colorfully decorated & the patio is truly a nice way to relax during the warmer months along Bardstown Rd. El Camino is located at 1314 Bardstown Rd, Louisville, KY 40204 and is open from 5pm-Midnight on weekdays and from 10-5 and 5-midnight on weekend. Give us a call for more Louisville Eats or to learn about Louisville Real Estate! 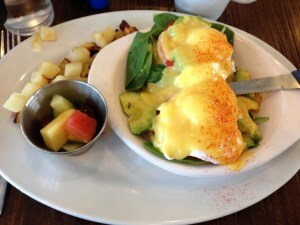 Meridian Café in Louisville KY is a great spot for breakfast or lunch. 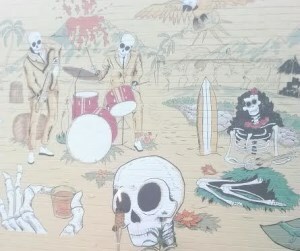 The restaurant provides a cozy atmosphere in a 1940s home & showcases an interior with local style artworks with table seating & a unique variety of salt & pepper shakers. The building is located at 112 Meridian Ave, Louisville, KY 40207 (just off of Shelbyville Rd in the vicinity of Trinity High School). Hours are 8am-3pm. My husband and I have been to the café several times for Breakfast and have always had a pleasant experience. Enjoy the menu options from traditional breakfast fare such as eggs, bacon, toast, & hash to an assortment of French toasts. I personally loved the French toast “Heddi’s Way” with mascarpone cheese & blueberry basil syrup. Yum! The menu also offers hummus, soups, salads, & sandwiches. The staff is friendly & service is generally timely. Seating is somewhat limited so arrive early if possible. 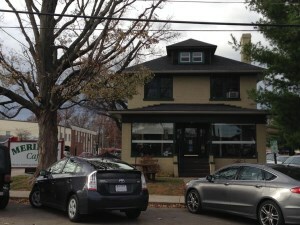 Meridian Cafe is another great option for foodies in Louisville! Call our team for additional information about the sights & sounds of Louisville or to discuss Louisville Real Estate! Louisville is definitely a foodie city and I can’t reiterate enough how glad I am for that. As if Louisville wasn’t already a great place on its own, it gets to boast a consistent stream of new and local restaurants where the chefs are artists and the food is delicious. 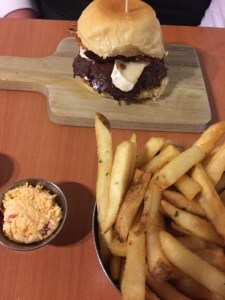 One local gem that I have been waiting to try for a while is Grind Burger Kitchen. Starting off as a food truck – the popularity of the burger turned this truck in to a full time restaurant on Preston Highway. From what I can tell, this place is here to stay. 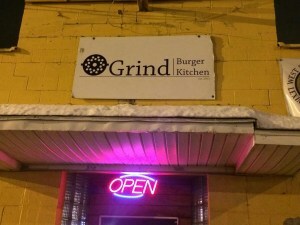 Good luck trying to find a “top Louisville restaurants”, “top new eateries”, or “top burgers in America” list without seeing Grind Burger Kitchen on it. This caught my attention and I couldn’t wait to find out what the buzz was about. I immediately followed Grind on social media and was pleasantly surprised to see how active Grind was with their fans. I haven’t heard anything less than amazing and raving reviews of this restaurant. 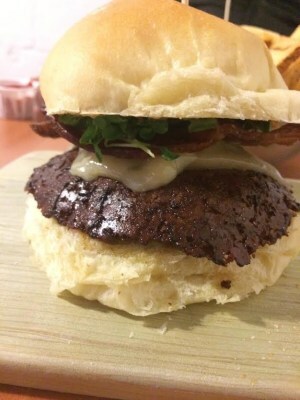 I finally made it to Grind Burger Kitchen in February, and while I wanted to order everything on the menu, I decided on the special of the week (which included Benton’s Bacon and garlic mayo as toppings) while my husband ordered the B&B Burger – the house special. As good as my burger was I had to make my husband switch with me because I could not get enough of the apricot jam on his burger! When you read the menu, the chefs tell you not to make any adjustments or substitutions to the B&B Burger and to trust them. I can’t recall ever ordering anything off of a menu without changing something but I followed the orders of Grind and trust me, you should too. Just order it how it comes. I was in Heaven. Every bite had lived up to all of my expectations of the restaurant. Even as I write this now I’m planning my next trip back. 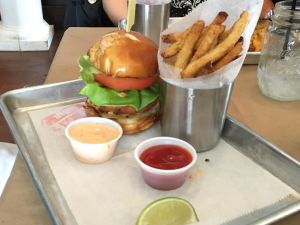 We highly recommend swinging by Grind Burger Kitchen! Grind Burger Kitchen is located at 3311 Preston Hwy and open Wednesday through Friday 11a-3p & 5p-10p and on Saturdays 11a-10p. Always check their website in case the times have changed. 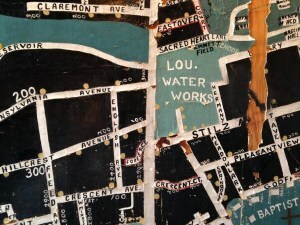 For more information about places to eat & things to do in Louisville, feel free to explore our blog. We also welcome the opportunity to speak with you about homes in Louisville! Interested in a trendy spot for brunch or dinner? 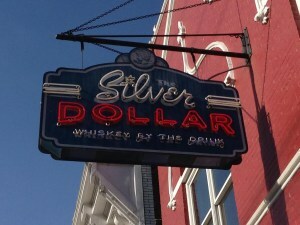 Try out The Silver Dollar on Frankfort. My husband and I recently stopped by The Silver Dollar for brunch. The atmosphere in the building is southern but also urban. The noise level is quite loud so be prepared for that. The restaurant was hopping with a good sized younger crowd 20s-40s. Along with a great brunch menu the restaurant also offers dinner. There is an awesome whiskey bar which earned a spot among the Top Ten Whiskey Bars in the nation in an issue of GQ Magazine. All of the food portions were large & rich so bring your appetite! I saw several plates of the cornbread pancakes go by and they were gigantic! I have to say I don’t think I could have finished half of them had I ordered them myself. 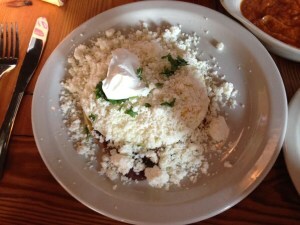 My husband ordered the Smoked Chicken Enfrijoladas & I had the Huevos Rancheros (hold the salsa). The food was good & very filling and the staff friendly. I would be interested to try their dinner or some samples from the bar. The Silver Dollar is located at 1761 Frankfort Ave in Louisville with Brunch Saturday & Sunday from 10am-3pm and Dinner Monday-Sunday 5pm-12am (bar until 2am). If you enjoy trying local places, this was a fun time. Be sure to arrive early as it fills up quickly. You can also make reservations online. Contact us to learn more about things to do in Louisville, local restaurants, or information about homes in Louisville. Professionalism, service, and genuine caring from Riad Otoum, Jason Justice, home inspector, AND Borders & Borders. All are truly exceptional. My background is Customer Service, and everyone exceeded my expectations. Thank you for a pleasant and rewarding experience. I will recommend you guys to all! Mr. Riad Otoum made the purchasing experience very fun. He is very knowledgeable in his field.